Professor Robert Winston presents a definitive three-part documentary series on the history of mankind's quest to understand the nature of God. The Story of God is an epic journey across continents, cultures and eras exploring religious beliefs from their earliest incarnations, through the development of today's major world faiths and the status of religious faith in a scientific age. The series examines the roots of religious beliefs in prehistoric societies and the different ways in which humanity's sense of the divine developed. It looks at the divergence between religions that worship a range of deities and those that represent strict monotheism. Professor Winston says: "However you define God, and whether you believe in God or not, the world we live in has been shaped by the universal human conviction that there is more to life than life itself; that there is a 'god' shaped hole at the centre of our universe. We have come up with many different ways to fill that hole, with many gods or just one, with gods of hunting, gods of farming, gods of war and gods of sea and sky." "But most of all the answer", says Professor Winston, "lies in the human desire to be united with something bigger than ourselves". He travels to the Gargas Caves in South West France where, he says, if the story of God has a beginning, it is to be found. He examines mysterious stencilled hand prints from 27,000 years ago which appear to have one or more fingers missing - do these represent early humans' attempts to reach out to God? In India, Professor Winston explores the origins of Hinduism and the emergence of Brahman as the supreme being with many different forms. Some experts believe that there may be 330 million gods across the Hindu faith and he looks at the notions of karma and reincarnation, also popular in Buddhism. While there are those who believe in many gods there are also those who believe there is only one true God and Professor Winston delves into the past to discover the beginnings of monotheism. Judaism, Christianity and Islam are examined in order to understand the ideas they share about God and the issues that divide them. 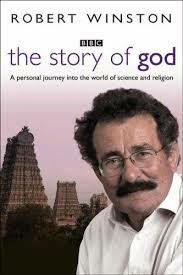 Finally he explores how belief in God has been challenged in the modern world by secular ideas, in particular science. He looks at those scientific disciplines (nuclear and astro-physics) where a convergence between faith and science seems possible. Professor Winston ventures into vast underground laboratories in Switzerland where they are trying to prove the existence of the 'God particle' and speaks to an American geneticist who believes there is a God gene which predisposes some people to have religious or spiritual beliefs. He also puts his own belief in God to the test with a mathematical formula that has been adapted to calculate the probability of God's existence. 01►ARE WOMEN MORE RELIGIOUS THAN MEN?